Die Sabbati, 31 Octobris, 1646. THE Grand Committee of the House met, to take into Consideration the Ordinance for appointing the Sale of the Bishops Lands. Mr. Sandys in the Chair. 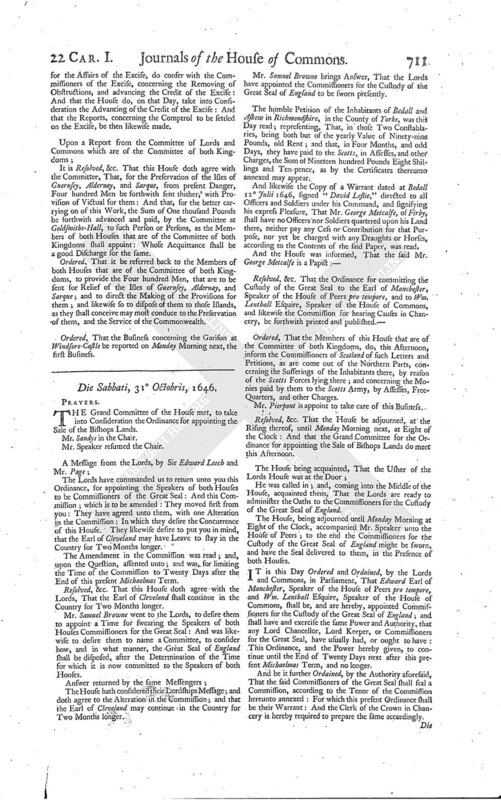 The Lords have commanded us to return unto you this Ordinance, for appointing the Speakers of both Houses to be Commissioners of the Great Seal: And this Commission; which is to be amended: They moved first from you: They have agreed unto them, with one Alteration in the Commission: In which they desire the Concurrence of this House. They likewise desire to put you in mind, that the Earl of Cleveland may have Leave to stay in the Country for Two Months longer. The Amendment in the Commission was read; and, upon the Question, assented unto; and was, for limiting the Time of the Commission to Twenty Days after the End of this present Michaelmas Term. Resolved, &c. That this House doth agree with the Lords, That the Earl of Cleveland shall continue in the Country for Two Months longer. Mr. Samuel Browne went to the Lords, to desire them to appoint a Time for swearing the Speakers of both Houses Commissioners for the Great Seal: And was likewise to desire them to name a Committee, to consider how, and in what manner, the Great Seal of England shall be disposed, after the Determination of the Time for which it is now committed to the Speakers of both Houses. The House hath considered their Lordships Message; and doth agree to the Alteration in the Commission; and that the Earl of Cleveland may continue in the Country for Two Months longer. Mr. Samuel Browne brings Answer, That the Lords have appointed the Commissioners for the Custody of the Great Seal of England to be sworn presently. The humble Petition of the Inhabitants of Bedall and Askew in Richmondshire, in the County of Yorke, was this Day read; representing, That, in those Two Constablaries, being both but of the yearly Value of Ninety-nine Pounds, old Rent; and that, in Four Months, and odd Days, they have paid to the Scotts, in Assesses, and other Charges, the Sum of Nineteen hundred Pounds Eight Shillings and Ten-pence, as by the Certificates thereunto annexed may appear. And likewise the Copy of a Warrant dated at Bedall 12 Julii 1646, signed "David Leslie", directed to all Officers and Soldiers under his Command, and signifying his express Pleasure, That Mr. George Metcalfe, of Firby shall have no Officers nor Soldiers quartered upon his Land there, neither pay any Cess or Contribution for that Purpose, nor yet be charged with any Draughts or Horses, according to the Contents of the said Paper, was read. Ordered, That the Members of this House that are of the Committee of both Kingdoms, do, this Afternoon, inform the Commissioners of Scotland of such Letters and Petitions, as are come out of the Northern Parts, concerning the Sufferings of the Inhabitants there, by reason of the Scotts Forces lying there; and concerning the Monies paid by them to the Scotts Army, by Assesses, FreeQuarters, and other Charges. Mr. Pierpont is appoint to take care of this Business. Resolved, &c. That the House be adjourned, at the Rising thereof, until Monday Morning next, at Eight of the Clock: And that the Grand Committee for the Ordinance for appointing the Sale of Bishops Lands do meet this Afternoon. He was called in; and, coming into the Middle of the House, acquainted them, That the Lords are ready to administer the Oaths to the Commissioners for the Custody of the Great Seal of England. The House, being adjourned until Monday Morning at Eight of the Clock, accompanied Mr. Speaker unto the House of Peers; to the end the Commissioners for the Custody of the Great Seal of England might be sworn, and have the Seal delivered to them, in the Presence of both Houses. IT is this Day Ordered and Ordained, by the Lords and Commons, in Parliament, That Edward Earl of Manchester, Speaker of the House of Peers pro tempore, and Wm. Lenthall Esquire, Speaker of the House of Commons, shall be, and are hereby, appointed Commissioners for the Custody of the Great Seal of England; and shall have and exercise the same Power and Authority, that any Lord Chancellor, Lord Keeper, or Commissioners for the Great Seal, have usually had, or ought to have: This Ordinance, and the Power hereby given, to continue until the End of Twenty Days next after this present Michaelmas Term, and no longer. And be it further Ordained, by the Authority aforesaid, That the said Commissioners of the Great Seal shall seal a Commission, according to the Tenor of the Commission hereunto annexed: For which this present Ordinance shall be their Warrant: And the Clerk of the Crown in Chancery is hereby required to prepare the same accordingly.